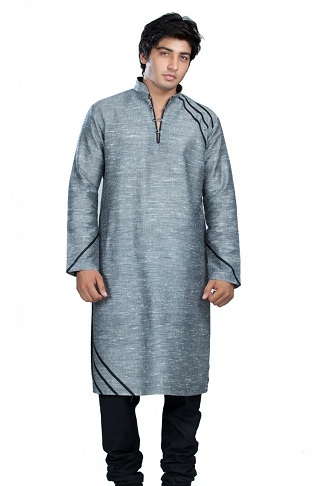 Discover what is new in this grey coloured Men’s Kurta. It is the special straight cut which is given right from the shoulders to the end of the kurta. And it has full sleeves with a pleasing and charming embroidery work in the neck and collar. The fabric used for this grey colour kurta is the pure art silk. 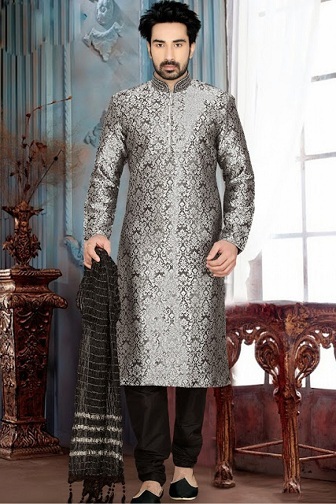 Have a look on this stunning grey kurta for men which are widely chosen as the perfect wear for a marriage reception. No special work is used here entirely in the kurta, but still it has a outstanding and sensational look. 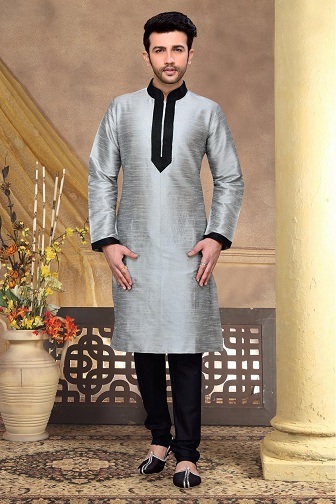 This grey kurta formen has been woven using a brocade material which is made up of grey Silk fabric. Additionally, it has black colour pajama and dupatta upgrading its look. Keep your eyes on this new grey kurta design for men which have a divine look. It does not have a special creativity pattern design but the special thing about this kurta is its own fabric. The material used for this kurta is a traditional dupion art silk and a thick silk cotton black colour lace for its neck. Here is the new trendy cotton grey color kurta for men that can be readily used for a happening evening party. It has full sleeves and has black stripes on it to highlight its gaze. There are various sizes available in this grey kurta designs for men, which makes it comfortable to all kind of individuals to choose this outfit as their desired one. These full sleeves closed neck cotton grey long kurtis for women would be the most prominent choice among young ladies. The sleeves and the bottom of the kurta has white and grey stripes border, which makes it the best part of it. The fabric used for this beautiful and elegant kurta is raw silk. Want to choose a plain and basic design of a cotton kurti for women? Then you can take a look over this outfit, after which you can come to the decision of owning it. 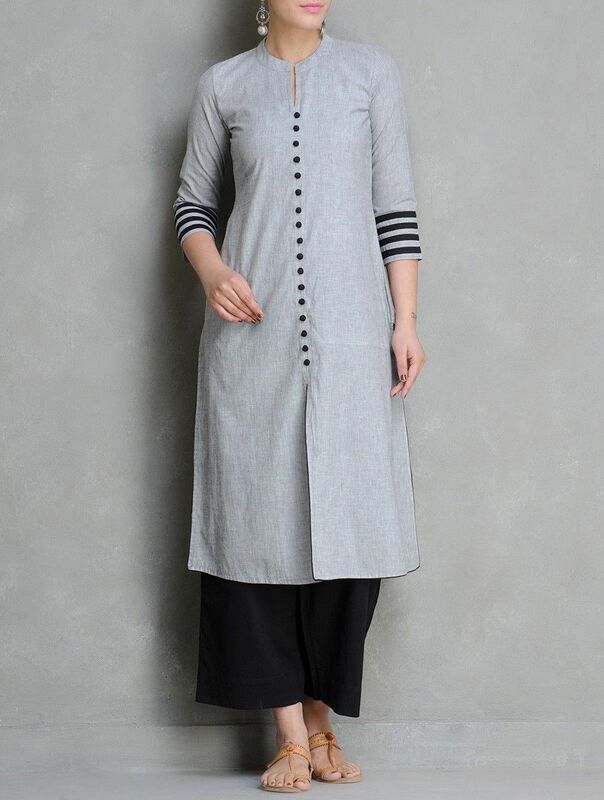 This plain grey kurti is as simple as it looks, at the same time, it is modest too. It is of poly cotton and has a lighter shade of grey. 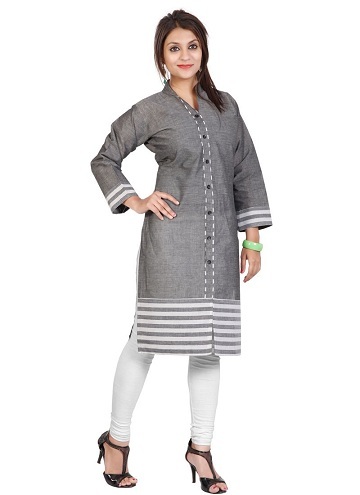 Make you look modern and stylish with this new design cotton grey kurta for women. It is sleeveless type and the fabric used is raw cotton. 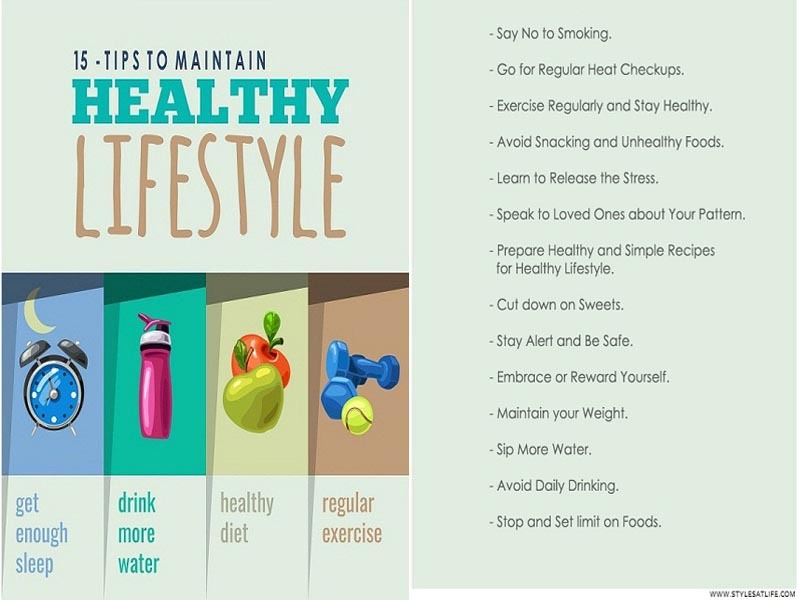 It has a printed design all over the material which makes it look more unique. 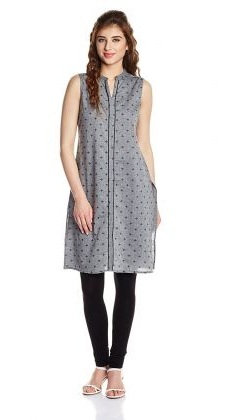 Explore this contemporary and chick grey color kurti for ladies that are of three fourth sleeves. 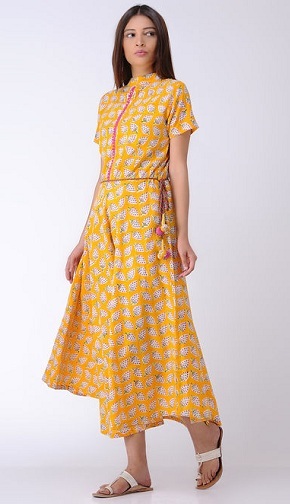 It has stripes pattern design in both the sleeves and full body of the kurti is plain. 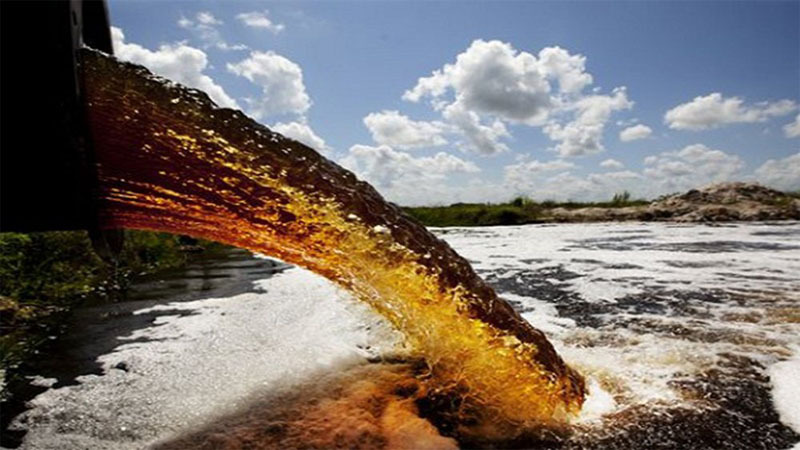 It has a front open slit which makes it look elegant. Here is the loveliest pattern of ladies kurti which can be easily mismatched with a blue jean or any pant style. 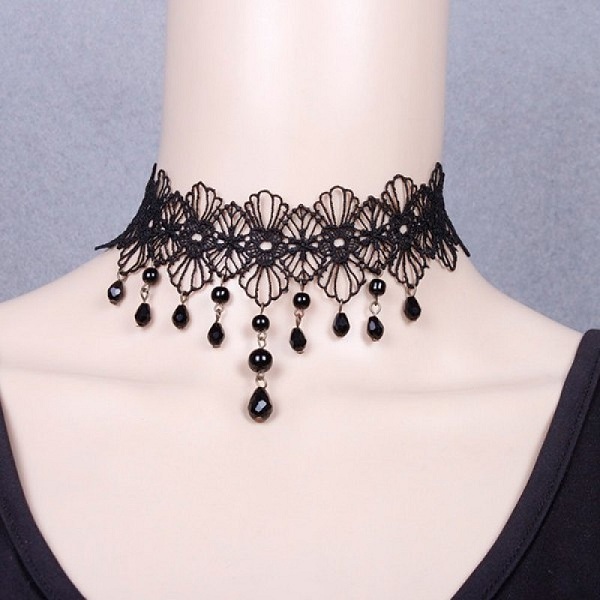 It has a simple embroidery work on one corner and a lace pattern is stitched in its neck. 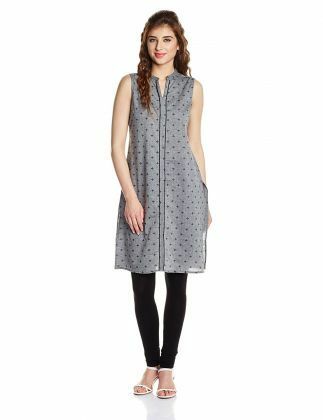 This grey kurti design would be the most liked among the young girls. For those who are crazy of grey shades, they can easily find their best choices from the image links of the description above. The top 9 collections given here, which is of grey colour, would be the most remarkable and outstanding ones among the other new modern kurti designs.